Rising from the ashes to become one of our favorite new restaurants last year, T9 (as it’s lovingly referred to) makes some of the freshest Mexican food in town. 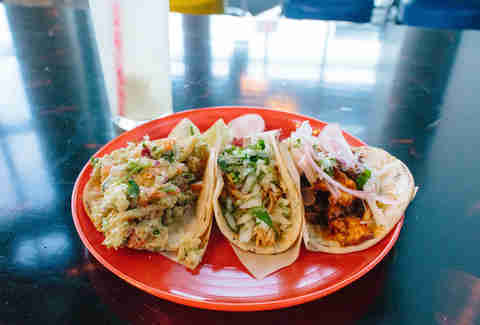 What else do you expect with a lineup of tacos that includes wild boar, brisket, achiote & banana roasted pork, and, depending on the day, a fish du jour that rivals the city’s best? Sure it’s one of the most popular taco joints around. 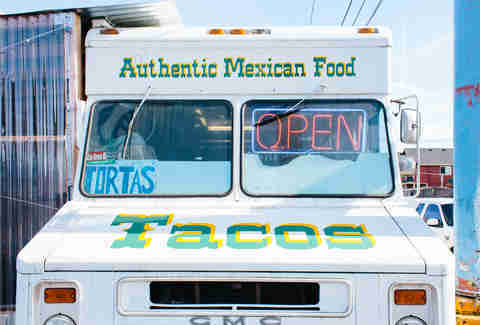 Okay, it is THE most popular place to grab a taco, but it didn’t get there by accident. It’s got the right vibe and quick enough service to keep the line moving. Plus the seafood options are plentiful with a daily fish, shrimp, and squid options. A hole-in-the-wall just South of Killingsworth, it would be easy to overlook this spot on your drive to a more popular street. You’d be remiss, however, as an old Bluehour chef has recently taken over the lease and is putting out some truly incredibly Yucatecan food. Including made-to-order tacos for a steal at $1.50. 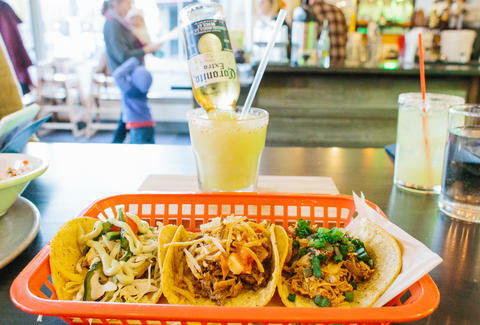 This airy, newer restaurant on Alberta has some of the city’s absolute best tacos. They're bringing in Three Sisters organic corn tortillas and topping them with Tex Mex favorites like fried avocado, refried black beans, and shredded brisket. They've also created knockout house sauces, the best being a by-request-only super-spicy concoction that you'll want to smuggle out with you. 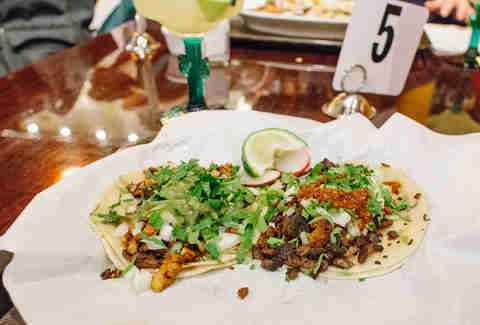 Gaining a following in St. John’s before moving Downtown, Taqueria Portland has set up shop across the street from Robo Taco in a small strip mall, but vaulted ceilings and large front windows make the space seem larger than it is. The tacos are only $1.25 and come with a never ending order of chips and a house-made salsa they could bottle and make millions. What you’re getting: Whatever sounds best at the time. You’re probably not going to remember. 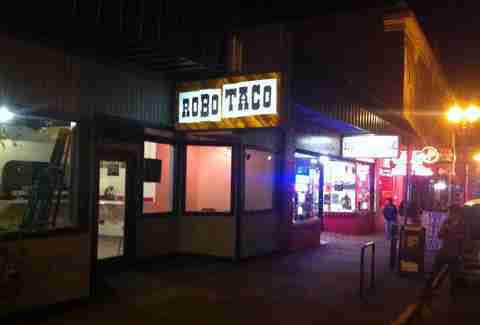 Although the handmade tortillas and can be inconsistent, Robo Taco captures the vibrant atmosphere a taco stand should at two in the morning. 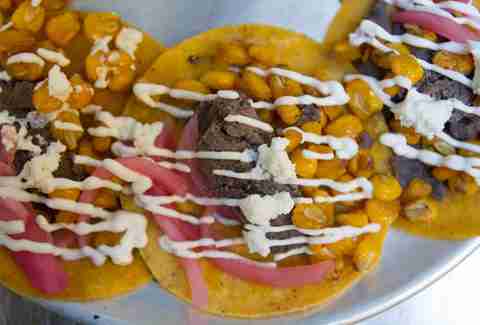 There’s no fuss in the menu, expect classics like pastor, barbacoa, asada, and carnitas. And there’re even four vegetarian options (three vegan!) so there’s something for everyone. A friendly staff and formidable menu make this spot one of the best options in the Southeast. 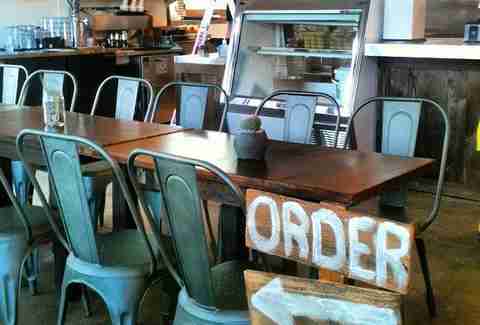 Choose one of about a million toppings at the counter before having a seat in an eclectically decorated dining room. The guys from Podnah’s put a tequila-soaked Tex Mex joint next to their absurdly popular barbecue restaurant and everyone immediately wanted to know if their brisket tacos would be the best in town. Duh! 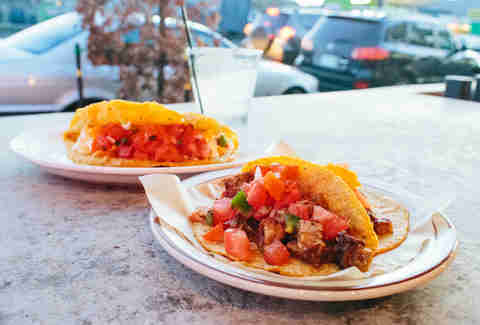 Another bonus is that their puffy tortillas outta San Antonio make for a lighter, crispier, and crunchier taco. 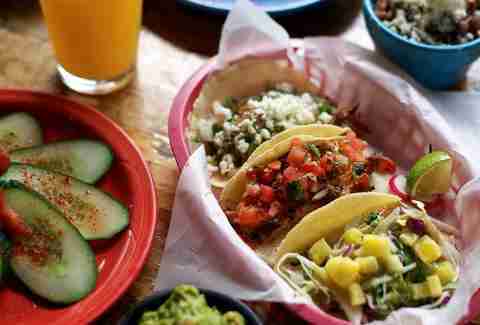 Not only does it have one of the best tacos in Portland, but Nuestra Cocina also gets the nod as one of our 21 Best Mexican Restaurants in America. 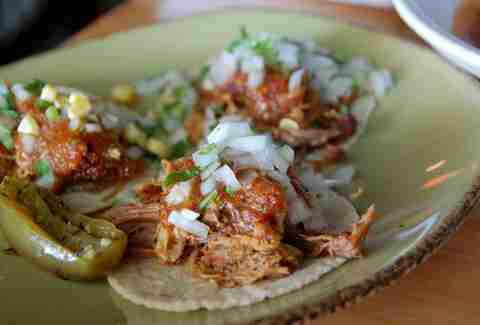 This is largely because of the tacos de puerco, a handmade tortilla wrapped around spicy pork and arbol chile. Apparently last year was a good time for food carts to go brick and mortar. A standout has been Tamale Boy’s seamless transition to popular neighborhood hangout in an area with no shortage of good food. Although it’s hard to resist its namesake tamales, don’t miss out on a stellar lineup of tacos. Our favorite? The tinga de pollo. 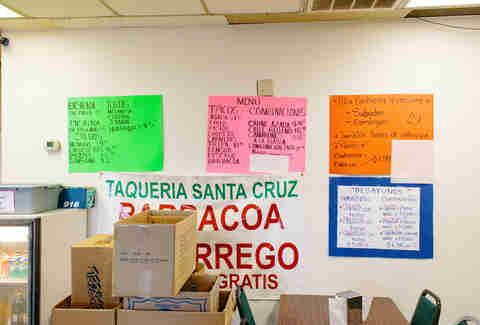 With two locations based around a bakery and market, Tienda Santa Cruz serves some of the most authentic tacos around. Since it's only a buck, go ahead and order the whole menu. Having recently opened a second location near the Timbers’ stadium, Uno Mas is now feeding customers on both sides of the river. Some 17+ variations adorn each menu, and that’s not counting the breakfast tacos offered in the morning. 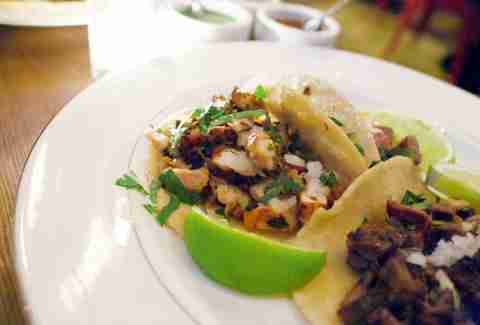 You can’t go wrong with the octopus or lengua, or the all-day happy hour on Sundays. What’s essentially a food truck with a small covered patio parked outside the brightly colored panaderia on 82nd, Los Alambres set itself apart by offering an enormous list of tasty tortas, but a lighter and cheaper option is the excellent selection of tacos. 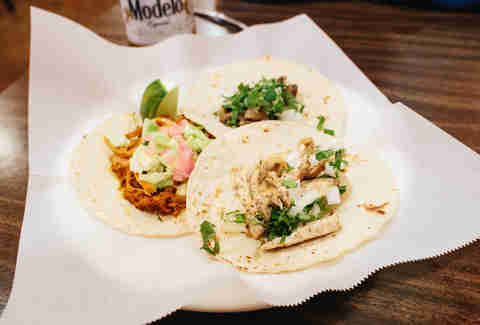 Try the birria or marinated pork.